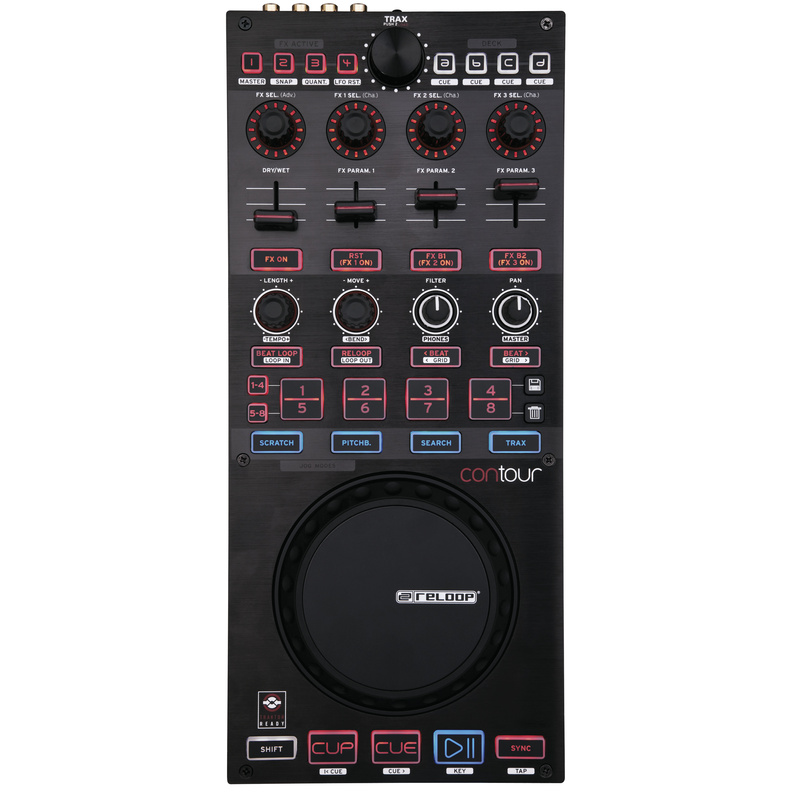 Following the great success of the Digital Jockey series, Reloop launches a modular controller by the name of "Contour" that can be perfectly integrated in every DJ software surroundings. 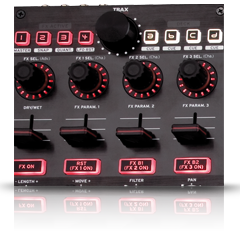 Configured and optimized for Traktor PRO 2, it is possible to control up to four decks, due to the intelligent deck switching system. In doing so the large, backlit buttons shed light on the current status via LED feedback. Thanks to the clearly arranged segmentation, sections for deck, sample, and loop control are ready on stand-by. 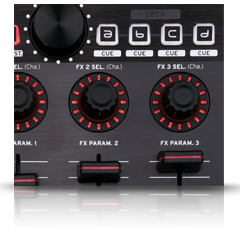 The extensive effect section disposes of 4 feedback encoders, 4 mini faders and further 4 rubberized buttons - intuitive remixing and controllerism deluxe. The touch-sensitive XXL jog wheel can be adjusted in 4 different modes, thus becoming interactively applicable. 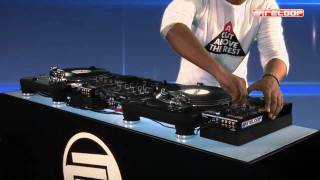 With an overall of 45 controllers on 4 banks the digital DJ has a lot of elbow room: All control elements are full-size and of professional quality. 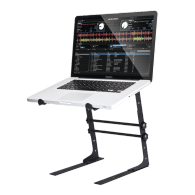 The high-resolution steering signal offers ultra fast and precise Traktor control - of course Contour can also be used as MIDI controller with any other software. Shape your performance: Get Contour. 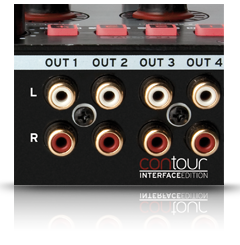 The Contour Interface Edition was especially developed for DJs that wish to integrate Traktor in their existing setup. 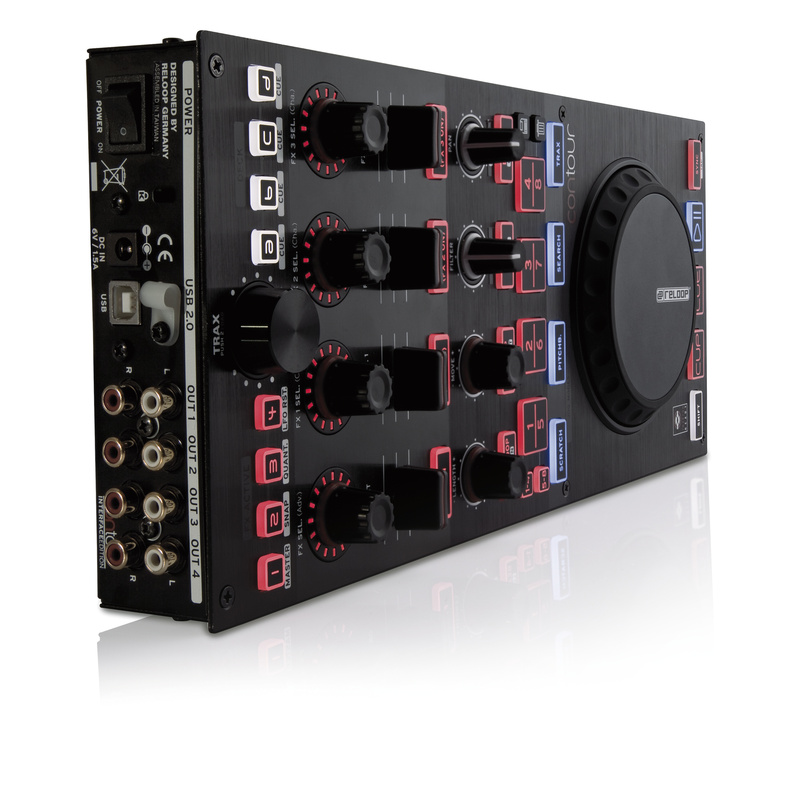 A hi-speed USB audio interface was implemented in this edition which allows routing up to 4 stereo channels to a mixer. 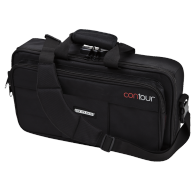 This way Contour can be used for transport, sampler/hot cue, effect and deck control while the mixer can be used for mixing the tracks. In stand-alone mode it is also possible to use Contour with a notebook. Two headphones connections on the front side for direct monitoring are at ones disposal. Shape your performance: Get Contour. 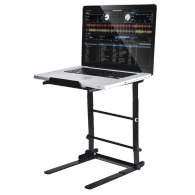 Mit dem Contour ist Reloop ein großer Wurf gelungen, der einem die Wahl schwer macht, sollte man sich vorher auf den Digital Jockey als Traktor-Controller konzentriert haben. 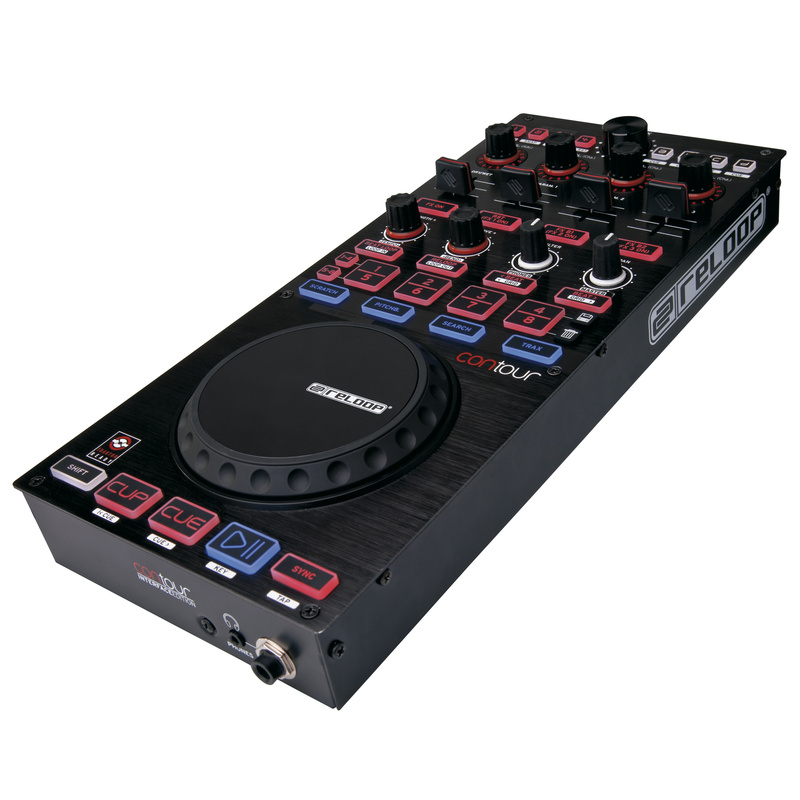 Schaut man aber genauer hin, bekommt man mit dem Contour einen akzentuierteren Controller, der die Features der Traktor-Software noch deutlicher auf den Punkt und daher noch einen Tick mehr Spielfreude bringt. 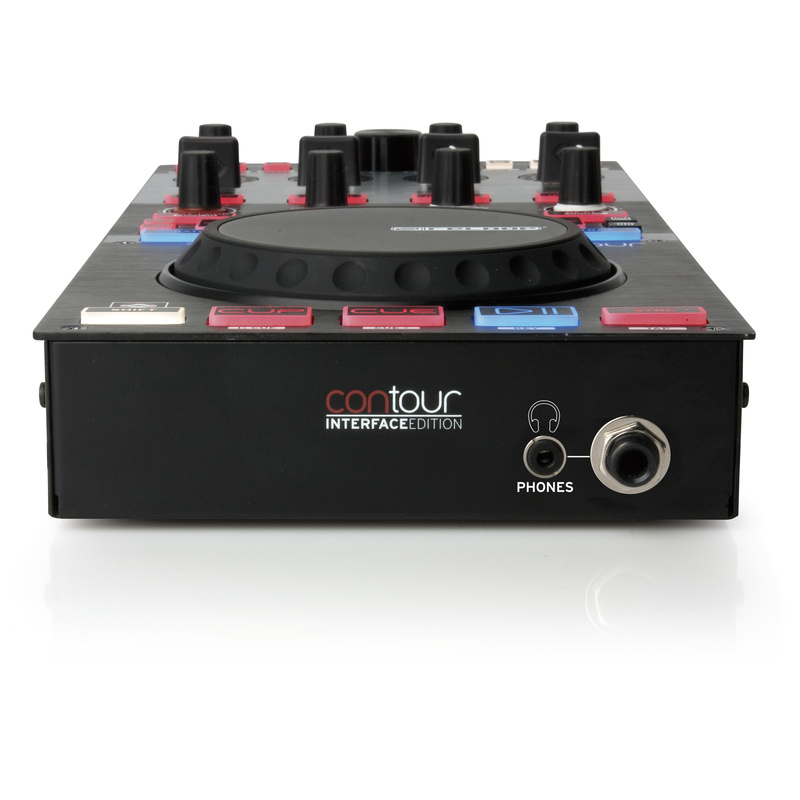 Reloop hinterlässt mit der Contour Interface Edition einen durchweg positiven Eindruck. Design, Verarbeitung und Funktionalität machen das Gerät zu einem professionellen Werkzeug bei jeder Preformance. 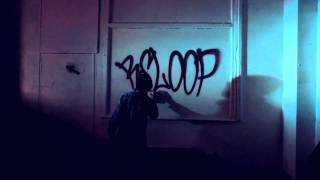 Der Reloop Contour Interface Edition ist ein rundum gelungener Controller. 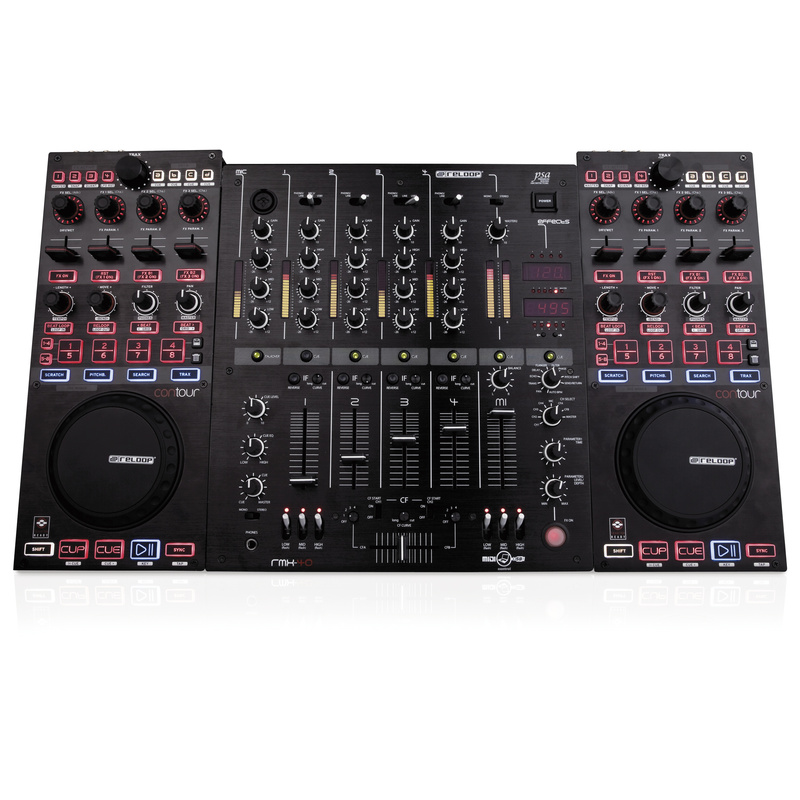 Er kann im Alleingang, aber auch in Kombination mit der Controller Edition aus gleichem Hause eingesetzt werden und erlaubt eine umfassende Steuerung der DJ-Software Traktor. 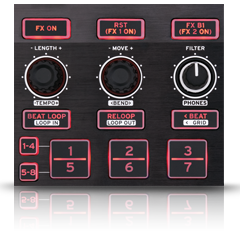 It took me only minutes to realize just how awesome the Reloop Contour Interface Edition really is. The design is fantastic and the ability to switch between all four decks on just one unit is something I’ve never seen before. From start to finish I also was constantly impressed by the build quality: the metal casing, the rubber knobs, and the bright LEDs all have the look and feel of an extremely well-made controller. In my opinion, the Contour is a definite buy, whether one prefers the Interface Edition or Controller Edition. The amount of value packed into just one of these units is truly amazing. 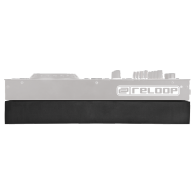 If you’re in the market for a well-built, compact, highly configurable and flexible 4-deck Midi controller for Traktor, complete with a built-in 8-out sound card, you should certainly have the Reloop Contour Interface Edition on your short list. 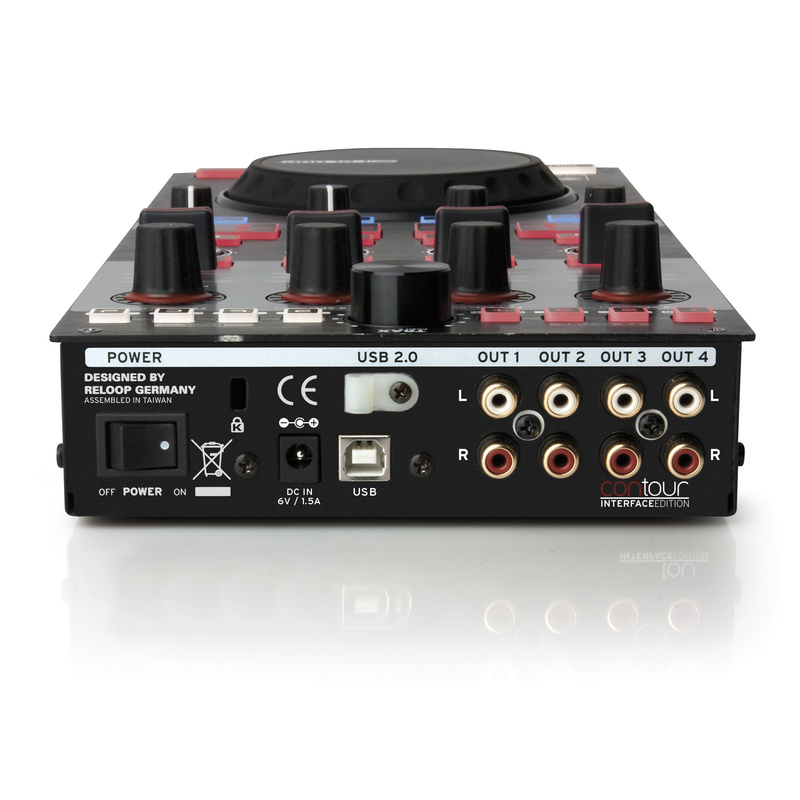 Es gelingt Reloop tatsächlich, mit nur einem Controller die Steuerung von vier Decks in Traktor Pro zu ermöglichen. Natürlich bedarf das Ganze etwas Eingewöhnung und Übung, jedoch mag dies durch den klar gegliederten Aufbau schnell von der Hand gehen – saubere Beatgrids vorausgesetzt, denn Contour setzt ganz auf die Synchronisationsfunktion in Traktor. 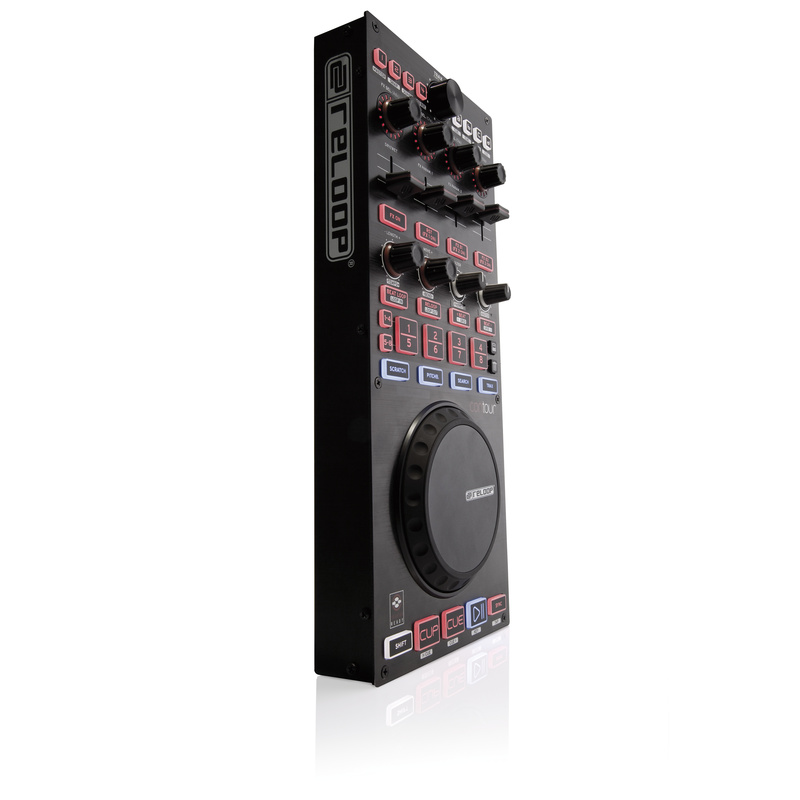 Overall I really like this controller, it is well built and responsive with a lot of control for the money. 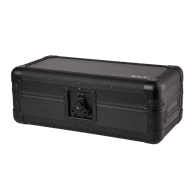 It’s not perfect, but I have to say that it’s very good in many areas and provides a lot of control possibilities. The physical housing is metal and solid but a little heavy, so it’s a trade off between build quality and durability vs. convenience and affordability. The layout is sensible and traditional, so everything is where you’d expect it to be. The only real problem I experienced is that it can feel tight and cramped when using side by side controls.